Ten presidents have stayed at the Riverside landmark throughout the decades. Ten presidents have stayed at the Riverside landmark throughout the decades. Looking for an historic getaway this Presidents Day? This is your California stop. HAIL TO THE CHIEF: If a celebrated stay-over spot has seen a few decades, chances are that at least a few of its rooms bear either the name of a famous guest or have a story attached. That's true for many California and West Coast hotels, thanks in large part to the number of actors who called the hotels home during on-location shoots. But what of presidential guests and the Golden State? Well, we've had a few presidents call California home, of course, and candidates do travel through quite often. But finding presidential-themed rooms in a landmark isn't quite the common thing it is around our nation's capital and the East Coast at large. There is a prominent exception here, a hotel so major that it served as the location for a recent president's honeymoon getaway, not to mention that it also boasts a piece of lobby furniture related to an earlier Commander in Chief. 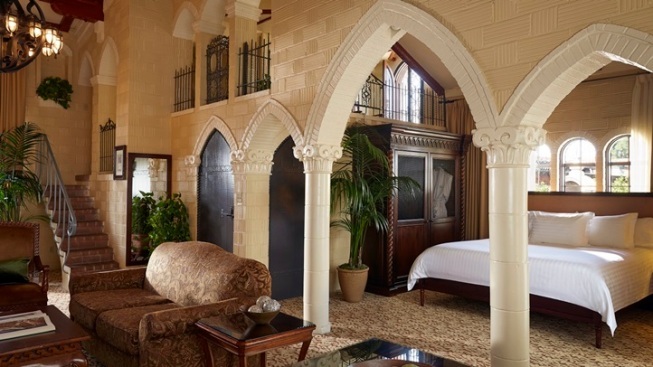 We speak of the Mission Inn, that castle-like, turrets-and-passages destination known for its holiday lights, its European aesthetic, and its Alhambra Presidential Suite. It's the same suite where Ronald and Nancy Reagan honeymooned, and guests may book it for their own stay. Which they do, frequently, especially when Presidents Day is on the horizon. MONDAY, FEB. 15... is the date of the patriotic, history-filled holiday in 2016, and the Riverside hotel's Live Like a President package includes an overnight in the Alhambra Presidential Suite, a VIP tour of the rambling, trivia-filled hotel, and dinner at Duane's Prime Steaks & Seafood (plus a spa treatment at Kelly's Spa). You can also call upon the Presidential Lounge for a special presidential-themed cocktail (several are named after past White House denizens). What to discuss while you sip? How that's the very room where Richard and Pat Nixon exchanged their wedding vows back in 1940. Hotels may have had presidents on their guest roster before, but to claim a honeymoon, and wedding, within your walls, is a big deal. Be sure, during your Mission Inn sojourn, to visit the President Taft chair in the lobby, near the hotel bar. It's a handsome piece of furniture, and, like so much else at the hotel, full of lore and history, both. WANT TO KNOW MORE ABOUT THE PACKAGE? Call the Mission Inn at 951-784-0300. The Live Like a President package is available from Feb. 13 through 15, 2016.